When you think of New Hampshire State Police, the image of a green cruiser on the side of the highway with a trooper running radar probably comes to mind. While traffic enforcement is a primary role of NHSP, it’s not all they do. Chief Photographer Freddy Wheeler and I spent nearly three months with road troopers and those in specialized units—from bomb squad and SWAT to K-9 and aviation traffic enforcement—to show you how they fight crime and protect you and your family. New Hampshire State Police covers the entire state and serves as the local law enforcement for communities with part-time or no police departments. NHSP does the job with 292 troopers. To put that into perspective, there are more legislators in New Hampshire than troopers. We begin with a ten-part, week-long series called Behind the Badge, followed by a one-hour special airing on Thanksgiving. This is something that has never been done before in the Granite State. In 2016, New Hampshire was ranked as the third safest state in the United States. We wanted to find out why. For the New Hampshire State Police troopers patrolling the roadways, every encounter is unique and potentially dangerous. In tonight’s Behind the Badge, we ride—day and night—with Troopers Jacob Wood and Stephan Czyzowski through their coverage area known as Troop B – which includes Manchester, the epicenter of the drug crisis in the Granite State. While it isn’t boating season, the officers of the New Hampshire State Police Marine Patrol Bureau still have an important job to do. We take you for a ride on beautiful Lake Winnipesaukee to show you how they keep you safe in and around NH waterways. When you think of traffic enforcement, these green marked New Hampshire State Police cars standing by along the highway are probably what come to mind. However, there are also troopers patrolling the roadways — from up in the air. In this segment of our special series — Behind the Badge—we ride and fly with the Special Enforcement Unit (SEU) so you can see how they crack down on dangerous driving. Keeping the roads safe for you and your family is one of the biggest roles of New Hampshire State Police. Reckless driving, drunk driving, and distracted driving—are among the greatest threats to your safety, but they’re not the only ones. When was the last time you drove next to a big rig—and got a little nervous? That nervousness is justified. Those large trucks and trailers can pose a danger. In tonight’s Behind the Badge, we show you how the Commercial Vehicle Enforcement Unit works to keep dangerous rigs off the road. Serving as a New Hampshire State Trooper in Troop F is unlike any other position in the division. This is where the least amount of troopers cover the most ground. Take a look at this map. Troop F encompasses 39 percent of the state. Some of the towns don’t have police departments, others are small or part-time. That means these troopers handle the majority of the emergency calls in these areas. We take you up north to show you the unique challenges these troopers face—day and night. The New Hampshire State Police Bomb Squad (Explosives Disposal Unit) is the unit you see on TV news when someone calls 911 about a suspicious package or a bomb threat. What you may not know is how they handle those calls and what else they do to keep people safe in New Hampshire. Solving crimes and saving lives using the latest technology. On this episode of Behind the Badge, troopers show us how some major upgrades to their rides are making their jobs a little easier and a lot safer. “Hi I’m Gary Ingham with the State Police K-9 Unit and you’re watching Behind the Badge on NH1 News!” Trooper Ingham is one of 15 New Hampshire State Police troopers in the division’s K-9 Unit. In this episode, we show you how the canine’s heightened senses help their trooper partners fight crime and save lives. All week, we’ve been introducing you to the men and women of New Hampshire State Police. We’ve taken you on the front lines to show you the threats and the challenges they face every day.You’ve seen what they do to keep you and your family safe—on the highways, on our waterways, and in your homes. Our ten-part series Behind the Badge – while comprehensive – is just the first course. On Thanksgiving, we will bring you a one-hour Behind the Badge special that goes even deeper. We’ll go inside the crime lab to find out how the drug crisis—specifically the push for convicting dealers— is impacting how technicians do their job. Securing the borders to prevent drugs, illegals and terrorists from flowing into the US is one of the biggest challenges facing the United States today. You know it’s a topic that has dominated the presidential race. However, the focus has been mostly on the Southern border and a debate about building a wall. We wanted to find out what’s being done to protect our Northern border. That job belongs to US Customs and Border Protection. There are three uniformed components—Air and Marine, Border Patrol and Field Operations. We’re focusing on these operations in what’s called the Swanton Sector. This sector covers parts of New York, Vermont and New Hampshire’s borders with Canada. 295 miles of border length—92 of them are water. And this entire area is covered by just 300 agents. “It does seem like a lot of space for 300 guys but through technology, through intelligence gathering, and stuff like that, we can leverage the manpower we have,” says Brad Brant, Special Operations Supervisor, Swanton Patrol Sector. We let them show you how they cover all that ground—on land, at sea and up in the air. “Our primary job is to protect and serve the American people. We’re like that first line of defense”– Gerhardt Perry, Air Interdiction Agent, CBP Air and Marine Operations. “We operate in the shadows. That’s where we’re most comfortable.” – Norman Lague, Patrol Agent in Charge, Swanton Sector. “Up here the border is a slash and a bunch of boundary markers.” – Brad Brant, Special Operations Supervisor, Swanton Patrol Sector. “We’re on the slash right now. This zone right here is called the International Boundary Commission Zone. It’s ten feet from the line to the North and 10 feet to the South.” – Dave Lacey, Border Patrol Agent, Swanton Sector. “I’ll pan out so you can see what we’re up against here. The landscape, geography, the foliage—all these things come into play, It’s very inhospitable terrain. It provides unique challenges—especially to the agents on the ground, so when we’re flying above it, we can see a lot more. We can cover a lot more area.” – Gerhardt Perry, Air Interdiction Agent, CBP Air and Marine Operations. “It’s very rough driving. It’s rocky, and there’s a lot of bogs, beaver dams, so it’s almost impassable.” – Dave Lacey, Border Patrol Agent, Swanton Sector. “You don’t know who it is, you don’t know who is crossing.” – Norman Lague, Patrol Agent in Charge, Swanton Sector. “Smuggling—human trafficking, drug smuggling, weapons of mass destruction—it could be anything.” – Gerhardt Perry, Air Interdiction Agent, CBP Air and Marine Operations. “… but we have to do our best to catch everyone because we can’t determine with technology we can’t look at the picture and say, we can’t say terrorist, drug dealer, prior deport. We can’t say that until we actually interdict that event, stop it from happening and go back and research and determine who we have.” – Brad Brant, Special Operations Supervisor, Swanton Patrol Sector. “We’ve got to be right, 100 percent, right? We only get that one chance that one opportunity.” – Kevin Packwood, Professionalism Service Manager, Port of Champlain. “Up here we use our intelligence, we use our technology, and our experienced manpower to do our jobs.” – Brad Brant, Special Operations Supervisor, Swanton Patrol Sector. “With the presidential candidate about the wall—I’m the wall. That’s how I feel. I’m the wall.” – Dave Lacey, Border Patrol Agent, Swanton Sector. “We look at patterns, trends. We look at information that we’re getting from the agents that are actually out in the field, our sensor crews, and our ATV crews. We take all of that information and with the technology that we have at hand, we build virtual fencing.” – Norman Lague, Patrol Agent in Charge, Swanton Sector. During our tour—that virtual fencing is put to the test. A call from the Port of Entry about a possible illegal border crossing. “We’re looking at a smuggling event right now. Whether it’s organized or not, not sure at this time… We suspect there’s a female somewhere in the woods right now,” says Lague. Now it’s up to Border Patrol agents to find her. Fortunately, a tip from a border town homeowner leads agents to the right doorstep. There’s another critical stretch of boundary, agents watch closely—Lake Champlain. Why? Anyone who sails through, can connect to the Hudson River and make it down to New York City—and beyond. “Did you know the ICW then goes from New York City all the way down around Florida to Brownville Texas? And that’s unchecked [by U.S. Customs and Border Protection]. So with that thought in mind, this is the only checkpoint for boats coming into this part of the country,” says Norman Stetson, Border Patrol Agent, Swanton Sector. The agents who protect our border region from drug traffickers and human smugglers admit their job is extremely challenging and dangerous, but their passion and dedication to protecting our country are boundless. “They’re relentless. They want to get their product, whether it be human or drugs, they want to get their product across, our job is to stop them,” says Lacey. Here are some statistics to give you an idea of how much they stop at the border.In the 2015 fiscal year, 2,626 illegal aliens were apprehended across the Northern border. 341 of them in the Swanton Sector. That’s almost one per day. US Customs and Border Protection can’t say how many got through, but if those people were caught by their cameras, agents are looking for them. Securing the borders to prevent drugs, illegals and terrorists from flowing into the US is one of the biggest challenges facing the United States today. You know it’s a topic that has dominated the presidential race. However, the focus has been mostly on the Southern border. We wanted to find out what’s being done to protect our Northern border. That job belongs to US Customs and Border Protection. There are three uniformed components—Air and Marine, Border Patrol and Field Operations. We’re focusing on these operations in what’s called the Swanton Sector—that includes New Hampshire, Vermont and part of New York. Tonight at 10, we’ll talk about drug traffickers and alien smugglers who cross the border. But those aren’t the only threats to our health, our safety and our economy. On average, 700 container trucks pass through Port of Champlain every day. Officers in the 9 booths at the primary arrival area for commercial vehicles have the daunting task of making sure NOTHING rolls through that could threaten our region and our nation. “We’re it. We’re the line,” Kevin Packwood, Professionalism Service Manager, Port of Champlain. Yando says eight percent of the container trucks—that’s about one out of every 12—will contain a food or product not allowed in the United States. “These are goods that cannot come into the United States because another government agency has set standards and we’re making sure that those standards are met for these products. In this case, they’re not, so we’re seizing them,” says Yando. Products deemed harmful by agencies like the Consumer Product Safety Commission, including children’s clothing with buttons that contain too much lead, and counterfeit goods. U.S. Customs and Border Protection uses import specialists to identify these products as well as unwanted pests and pathogens. Those officers focus on what’s coming through the actual ports of entry. Tonight at 10—we introduce you to the agents who patrol the areas in between. It’s a story you don’t want to miss. A huge turnout today at the 6th annual New Hampshire 9/11 Memorial Stair Climb in Downtown Manchester. More than 400 people—including firefighters from across the region—are climbing the stairs of the Brady Sullivan Tower five and half times. It represents the 11 stories of the Twin Towers in NYC where 343 firefighters died. For 23-year-old firefighters Travis Gray and Colton Peledieu, this is their 1st Memorial climb. “I’m very nervous for this. I’m not really sure what to expect. 110 floors is a lot,” says Gray. While they were only in 4th grade at the time of the attacks, both say it inspired them to become firefighters. “Seeing all those firefighters rush in selflessly saving everybody, I knew at a very young age that it was something I wanted to do,” says Peledieu. In honor of those who died, they’re taking on this grueling challenge in full gear. “I think it would let my brothers and sisters down if I didn’t wear full gear,” says Travis. “This is how they did it that day, this is how we’re going to do it today,” says Peledieu. Rocco Caprarello, Station Manager for AMR in Manchester is ready and waiting for anyone who needs help. Two candidates in Tuesday’s Primary tells us why they also took part. “It’s still a dangerous world and we could still be called upon to sacrifice and that’s why remembering is so important,” says Rich Ashooh, 1st Congressional District GOP Candidate. If or when that day comes, firefighters Gray and Peledieu will be ready. As of early Sunday morning, $25,000 dollars has been raised for the National Fallen Firefighters Foundation—twice as much as last year. Click here to learn more about the foundation. Man’s best friend is one of law enforcement’s greatest assets in battling the drug epidemic in New Hampshire. 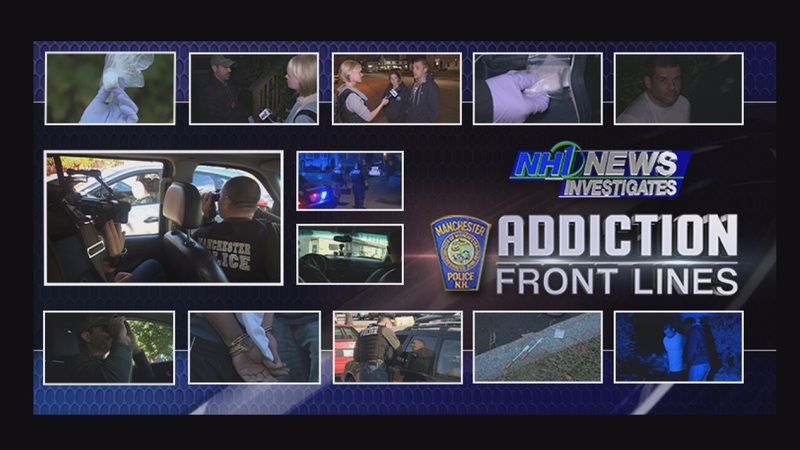 Our NH1 News Special Investigative Series: Addiction Front Lines continues tonight, with a spotlight on K-9 Crime Fighters. For thirteen years, Officer Keith Mackenzie of the Rochester Police Department has patrolled the streets as part of the K-9 unit. He says fighting on the front lines of the drug epidemic keeps them extremely busy. “We’re a lot more active these days, unfortunately,” says MacKenzie. Fortunately, MacKenzie’s two partners—Daisy Mae and Phlirt—literally have the nose for detecting drugs, dealers and users don’t want them to find. As the head narcotics trainer with the Working Dog Foundation, Mackenzie helps turn that natural talent into a crime-fighting tool for law enforcement agencies across the region. “They come every Monday and we put thousands of hours in our dogs,” says MacKenzie. “With the dogs, it’s a totally different game,” says Sgt. Shaw, who travels from Maine to New Hampshire every Monday to train with his dog Proxy. Basically, the game is hide-and-go-seek. First, the dogs learn to detect the scent of hard drugs—including meth, cocaine and heroin. Officers take the drugs—on loan from the DEA lab in Washington DC—tuck them into these chew-proof “narc-safe” pouches, and hide them in the types of places they’d be called in to search. When the dogs find them, they’re rewarded with fun time, which usually involves a ball or a squeaky toy. “As she’s running back, she’s relating that odor to fun,” says Shaw. It’s a process that builds strong skills and potentially life-saving partnerships these officers rely on every day they’re on the job. “The dogs have helped me out several times – twice which I can think of,” says MacKenzie. These dogs are also used in searches. 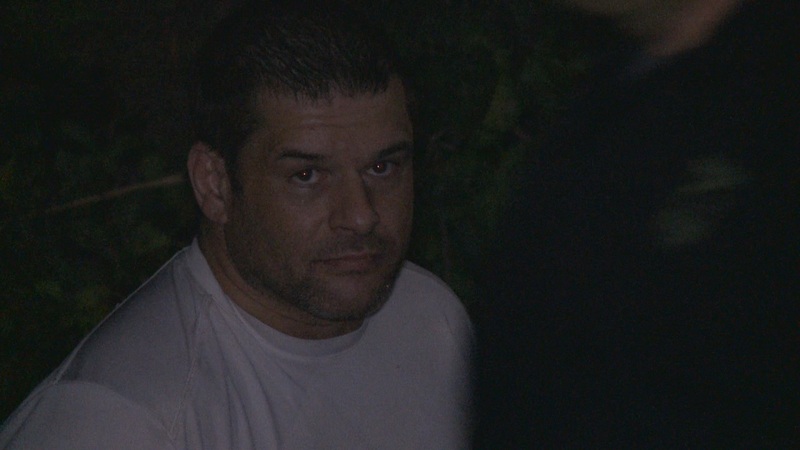 In fact, Officer Mackenzie and Daisy Mae were called in on a manhunt in Northern Maine to find an armed murder suspect. They found him in about 90 minutes. That just happens to be one of the reasons Mackenzie was named New Hampshire’s Officer of the Year in 2015. So far, the Working Dog Foundation has trained more than 200 police K-9s. Right now, 17 teams are training with the organization from law enforcement agencies in New Hampshire and Maine. Follow me on Twitter and Facebook and I’ll share some great behind-the-scenes videos of these officers and their amazing dogs. If you’re just reading about this for the first time, Jillian reached out to us because she was burned by the liquid inside this cell phone case when it cracked. She bought this sparkly case at the Cellairis kiosk in the Mall of New Hampshire. After she got burned, she went back to the kiosk because she wanted to find out what’s inside the case. It came without any packaging, so she had no details about the chemical composition of the liquid and couldn’t tell if there were any product warnings on the packaging. Since our first story aired, a second viewer came forward, saying she was also burned by the liquid in these cases. Concord Attorney Jim Steiner says that lack of critical information poses serious threats to your safety and may violate consumer protection laws. I bought the same cell phone case from that kiosk and they wouldn’t give me the packaging either, claiming they don’t fit into the display when in the box. I reached out to Cellairis—and one week later—I received this statement. Cellairis turned down our request for an interview. In an email, its marketing manager claims that a letter has been crafted for its franchises asking them to remove this type of product from their shelves. We have not been provided a copy of that letter or a timeline of its release and ultimate removal of the liquid cases. In the meantime, we are sending the case to a lab for analysis. If you’ve been burned by one of these cases, please send me an email at cmcarthur@nh1.com.